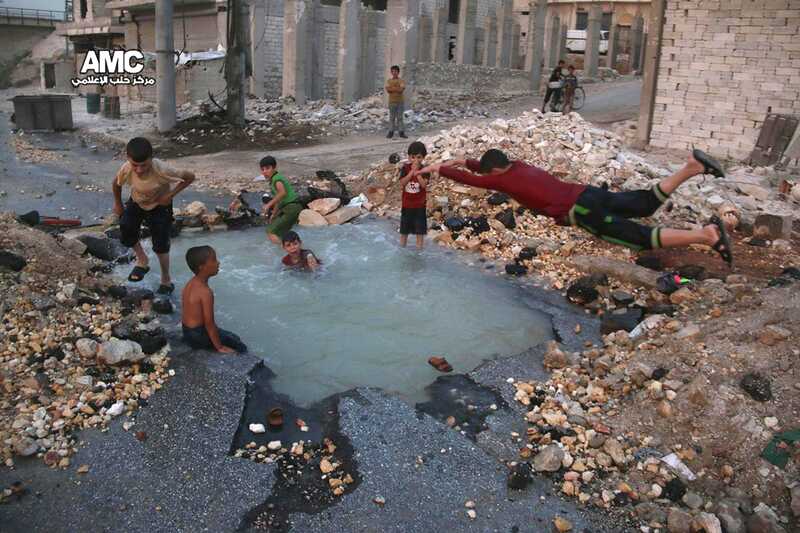 Syrian children had some fun in a makeshift pool amid the rubble of their rebel-held and war-torn home city of Aleppo. Photos posted by the Aleppo Media Center on Wednesday showed several children playing in a crater caused by a missile strike that had collected water from a damaged pipe. The AMC's tweet reads: "Whatever Assad has done in Aleppo, life isn't over -- its children make a new life in every site destroyed by his rockets. Sheikh Saeed District #AleppoAMC." The makeshift swimming pool was in the southern district of Sheikh Saee. Under the regime of Syrian President Bashar al-Assad, people have suffered from brutal conflict — ongoing missile attacks, bombs and artillery fire — for several years. AMC has documented horrifying footage of the impact of war on Aleppo, including the the heartbreaking video of a young boy's rescue that captured global attention.